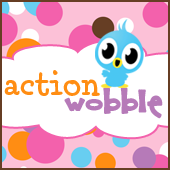 Action Wobbles: Party Box With Midge!!! Hey everybody! Midge here, and today I have a super fun project to show you. We have another party coming up and I wanted to have some cute table decorations. I found a few of these boxes in my stash and knew they "could" be perfect! They are going to look cute on the tables AND I am filling them with treats so I can give them away as prizes. I LOVE a good double duty project! Well I hope you enjoyed my project today. If you would like to get some fantastic Action Wobbles of your own, head on over to the Queen's Royal Castle Shoppe by clicking here! Come on back and visit us often. Have a super crafty day! Recipe for the box? I have some wobblers. But I'm going to check outyour prices. Box recipe? Party! party! way to go with that Party Wobble box! Beautiful creation as usually from a Top Designer! Love your work!